One New Aftermarket Replacement Pressure Plate made to fit John Deere Tractor Models: 1641, 1641F, 2040S, 2140, 2355N, 2550, 2555, 2650, 2650N, 2750, 2750, 2755, 2850, 2855, 2855N, 2940, 2950, 2955, 3040, 3050, 3140, 3150, 3350, 3640, 3640S w/ 13.03 Flywheel I. 12.875, cast iron, w/ release plate w/. 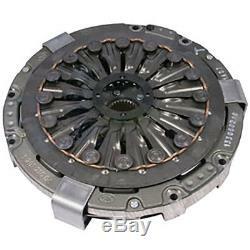 Replaces Part Numbers: AL67184, AL68485, AL36134, AL38670, AL39245, AL39591, AL55240, AL59324, AL65891, AL68483, R39591, R39591S, R64968, VPG1069, VPG6500. Reliable Aftermarket Parts is in not affiliated in any way with OEM manufacturers. All OEM part numbers and logos are to be used for identification purposes only. We carry parts for Engines, Transmissions, Front & Rear Axles, Hitch & Drawbars, Undercarriages, Final Drives, Seats, Bearings, Cups, Cones, Seals, Discs, Couplers, Gears, Brakes, Pressure Plates, Pilot & Throw Out Bearings, Ring & Pinions, Gaskets, Decals and MORE for most high wear items. We also carry replacement parts for the Boom Cylinder (Seal Kits, Tubes, Glands, Pistons, Rods). 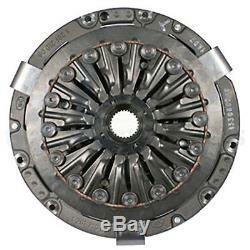 The item "JOHN DEERE CLUTCH KIT 2355 2550 2555 2750 2755 2855N 2940 2950 2955 3050" is in sale since Thursday, November 6, 2014. This item is in the category "Business & Industrial\Heavy Equipment, Parts & Attachments\Heavy Equipment Parts & Accessories\Antique & Vintage Equipment Parts". The seller is "reliableaftermarketpartsinc" and is located in Williamston, Michigan. This item can be shipped worldwide.